The midterm election for Taiwan will take place on 24th of November, but how will the future governors development green energy at the local government level? 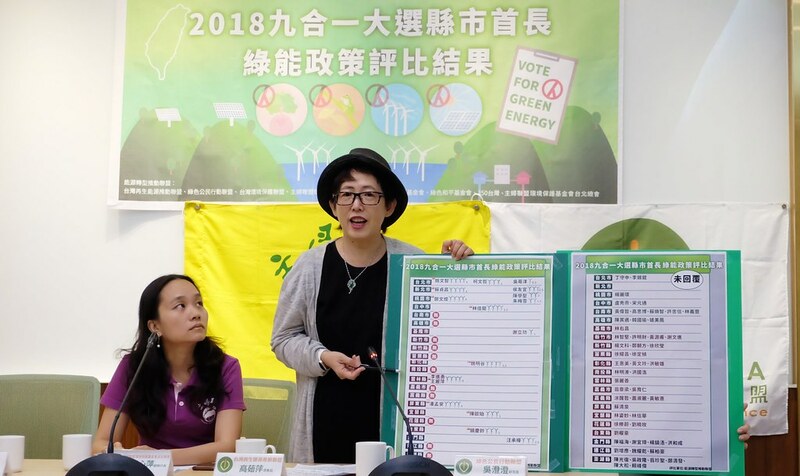 Taiwan Renewable Energy Alliance(TRENA) recently asked all the candidates to elaborate their renewable energy policies; of the 92 candidates running for governor, 21 were not available, 54 did not answer, and in the end only 17 did give a reply. None of the candidates from the 11 local governments of Kaohsiung, Tainan, Hsinchu city, Hsinchu county, Miaoli, Nantou, Chiayi city, Chiayi county, Hualian, Lienchiang, and Penghu gave a reply. The results was puslished on 9th of November. In Taipei city Yao Wen-chih(姚文智) has a better policy than Ko Wen-je(柯文哲), in New Taipei City Su Tseng-chang(蘇貞昌) outperformed Hou You-yi(侯友宜), in Taoyuan city Cheng Wen-tsan(鄭文燦) aced Apollo Chen(陳學聖). None of the candidates in Tainan and Kaohsiung replied. Class A: Yao Wen-chih(姚文智) of Taipei city, Su Tseng-chang(蘇貞昌) of New Taipei city, Cheng Wen-tsan(鄭文燦) of Taoyuan city, Lee Chin-yung(李進勇) and Wang Li-Ping(王麗萍) of Yunlin county, and Pan Men-an(潘孟安) of Pingtung county. Class B: Lin Chia-lung(林佳龍) of Taichung city, Wei, Ming Ku(魏明谷) of Changhua county, Ko Wen-je(柯文哲) of Taipei city, Chen Ou-po(陳歐珀) of Yilan county, and Lao Ching-Ling(饒慶鈴) of Taitung county. Class C: Hou You-yi(侯友宜) of New Taipei city, Wong Chen-Hwa(汪承樺) of Kingmen county, Apollo Chen(陳學聖) of Taoyuan city, Hsieh Li-Kung(謝立功) of Keelung city and Wu Eh-Yung(吳蕚洋) of Taipei city. Kao Ru-Ping(高茹萍) of TRENA explained the results. Yao Wen-chih planed to establish a green energy building passport and co-op for civil green energy. Su Tseng-chang planed to coordinate between different bureaus and purpose more energy education, something the society generally needs currently. Lee Chin-yung noted the need for solar panels to co-exist with agriculture and fish farms, and he also mentioned regulations on recycle mechanism for solar panels. Pan Men-an delighted the judges by promising to set up demonstration sites for solar panels to co-exist with agriculture and fish farms. On the other hand, though Ko Wen-je(柯文哲) did build solar farms on landfill sites, the judges believed that more could be done, given the abundant resources in Taipei city. New Taipei city also has a well developed green energy policy currently, but the content of Hou You-yi(侯友宜)’s policy was not concrete. TRENA has uploaded the replys from the candidates. As for those who did not answer their questions, Kao Ru-Ping(高茹萍) encouraged voters to demand green energy policies from them. The assessment was carried by TRENA, Green Citizen Action Alliance(GCAA), Taiwan Environmental Protection Union, Housemaker United Foundation(HUF), Citizen of Earth Foundation, and 350 Taiwan. Wu Chen-chen(吳澄澄), researcher of GCAA, said that the reason why green energy policies were not the core of the campaign could perhaps be attributed to the fact that energy policies were mostly centralized at the national government level in the past. However, autonomy for energy policies has been increasing in recent years, and she wished that such assessment could let governors of local government care more of the development of green energy. Wu Hsin-Ping(吳心萍) of the HUF pointed out that green energy development was not only about speed and amount of deployment, and that public support would be necessary for the success of policies. Governors could, Wu suggested, also think of ways to gain create local welfare with renewable energy, for example using the revenue for long care, school lunch, and meal gatherings for the elderly.